THE BOOK: The Remaining Ingredients. THE PUBLISHER: Ragged Sky Press, an independent, cooperative press. SUMMARY: This is the second collection of poetry by Ellen Foos. THE BACK STORY: These poems represent the past ten years of work. WHY THIS TITLE? : The title comes from a line in one of the poems. It reflects my love/hate relationship with cooking. WHY WOULD SOMEONE WANT TO READ IT? Poetry readers who already know my work or know about Ragged Sky will want this book. The cover and quotes are very appealing so someone might buy it on that basis. AUTHOR PROFILE: Ellen Foos is a senior production editor for Princeton University Press and the publisher of Ragged Sky Press. She has received fellowships to the MacDowell Colony and the Vermont Studio Center. She coedited Dark as a Hazel Eye: Coffee & Chocolate Poems and Eating Her Wedding Dress: A Collection of Clothing Poems. Her own poems are gathered in Little Knitted Sister and have also appeared in Mead, The Curator, Edison Literary Review, and Contemporary American Voices. AUTHOR COMMENTS. I hope to reach common ground with the reader so we both discover something new in what could be an everyday experience. full circle around the house. we had two sharp corridors. the ladder he stored there. 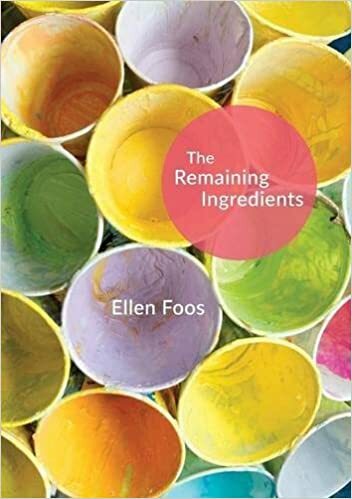 From The Remaining Ingredients, copyright 2016 by Ellen Foos. Do not copy or distribute in any form without express permission of the author.